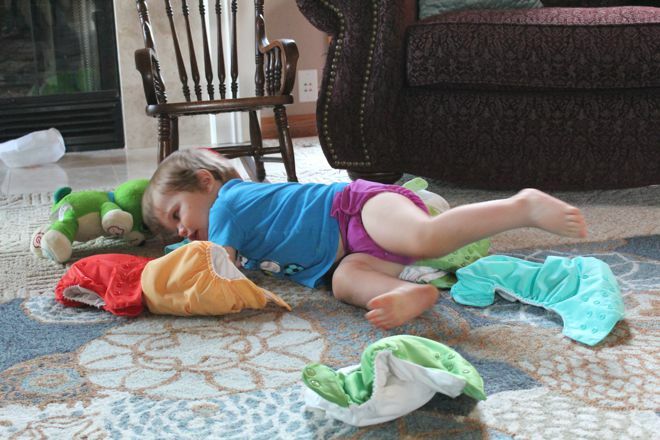 Earlier this week you saw my nerdy breakdown of why cloth diapering really does save money, even if you wait until your kid is 18 months old to start. Here’s a quick look at our methods (so much less complicated than it may appear when you first research all the options out there). Why? This brand and particular style comes recommended by several friends. I love that they are adjustable to fit newborns up through potty training age. The snap closures are much more durable than the velcro option and should last a long time. How do they work? The diaper has a pocket where you insert absorbent pad(s) called inserts. 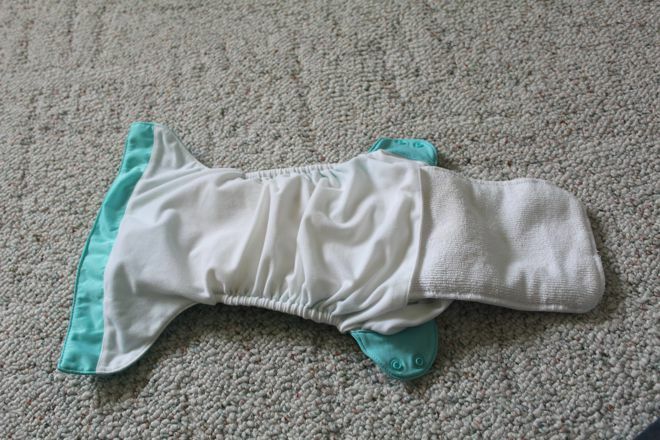 Each diaper comes with two inserts: newborn size and regular (adjustable) size. During the day, Corban wears them with just the regular insert. At night, he wears them with one regular insert and two newborn inserts layered inside. We have only had a couple of leaks, and those were more due to our learning curve than the diapers themselves. 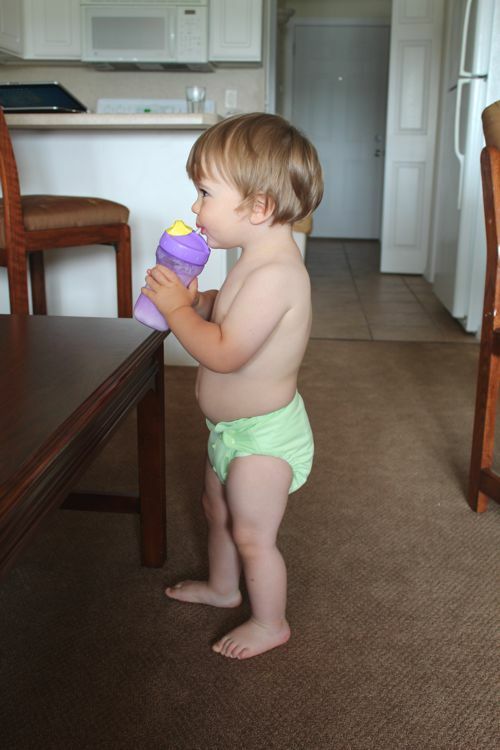 You can use additional flannel or other absorbent materials inside the diapers as well. What’s the process for a diaper change? If it’s wet, change the diaper (we don’t use wet wipes on wet diapers, but may use a dry rag just to dry him off). Pull the wet insert out of the diaper and put both the diaper and insert in a reusable pail liner (soon-to-be hosted inside a small flip-top garbage can, which I have yet to make the trip to Target to purchase). If it’s poopy, we wipe Corban with disposable wet wipes (I do plan to switch to cloth wipes at some point, but we still have a bulk box of disposable wipes to use up) and throw the wipe(s) away in the Diaper Genie (relic from the disposable days, but still useful!) We dump the poop in the toilet, sometimes with the aid of some toilet paper, and flush it away. Then we pull the insert out and place both diaper and insert into the pail liner. We don’t rinse the diaper at all unless it’s really messy, and in that case we use our laundry room sink’s sprayer so as not to contaminate any sinks that we use for hygiene. How do you wash them? Every other day, after Corban goes to bed I empty the pail liner into the washer, turning it inside out and throwing it in with the diapers. First, I do a cold rinse (15 minutes) with no detergent. Then I set it to a hot wash/cold rinse with an extra rinse cycle and 1.5 teaspoons of powder detergent. I sometimes put it on delicates, since that uses more water in a high efficiency machine and decreases the risk of leaving any detergent residue behind on the diaper, which can cause problems down the road. I’m still trying to figure out if that’s necessary. If I forget to wash them at night, our nanny will do it the next morning. What kind of detergent do you use? There are only a handful of detergent brands that are recommended as safe for cloth diapers. You don’t want to use a detergent that has any fragrance or other additives that can deteriorate or stick with the diaper. I had a hard time at first finding any of the recommended detergents anywhere in the Milwaukee area. You can always order online, but I had already started using my diapers so didn’t want to have to wait to wash them. I finally found Country Save detergent at Outpost on Capitol Dr. in Milwaukee ($16.99 for a box that I calculated should last me almost four years!). I use 1.5 teaspoons of the powder per load – this was just a guess based on others’ recommendations for high efficiency front-loading machines, but it seems to be working well. 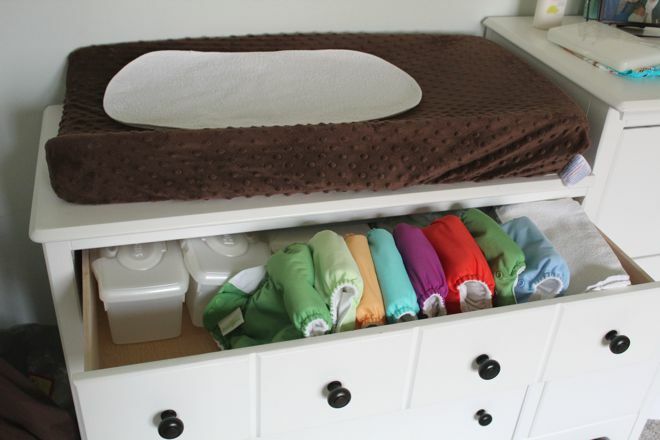 You want to use much less than the amount you would for a regular load of clothes because it will harm the diaper’s performance and could even cause diaper rash if there is any detergent residue left on the diaper. A pile of washed diapers is perfect for jumping into. How do you dry them? I throw the inserts and the pail liner in the dryer on extra low, although I probably should line dry them in the interest of saving money. The diapers shouldn’t go in the dryer, so I line dry them by either draping them over hangers in the laundry room or laying them outside on our deck if it’s daytime. Letting stained diapers dry out in the sun miraculously bleaches them back to a perfect white! That still amazes me. Drying inside overnight, they sometimes are a little damp in the morning, but are good to go by Corban’s second diaper change of the day. What will you do with the new baby? We will obviously need more diapers when we’ve got two little ones. Target recently clearanced out their stock of Charlie Banana one-size diapers, which are really similar to the bumGenius 4.0s, so we were able to snag them for 50% off! With tax, it ended up being less than $8 per diaper. We have 18 of them. I’ve heard this brand fits a bit narrower than bumGenius, so hopefully they will work well for a newborn. As soon as the baby is big enough to fit into the diapers (supposedly at around 8 pounds) we will start using them. Breastfed baby poop is water soluble and not smelly, so it should be a bit easier than with Corban’s stinkers. It’s all a piece of cake, really! Awesome post! We also cloth diaper! Glad to see another happy baby enjoying the perks! We use Kawaii…which are similar to Bumgenius. 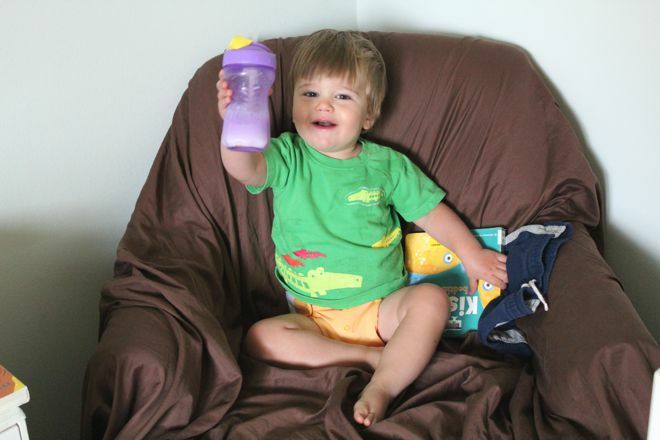 I actually purchased diaper wet bags from planet wise that we love… they hold the stink in! Just a though if you want other options besides a flip can.